The Call for Participation for Wikimania 2009 has been released. Submit your presentations before April 15. "Navy Bean" redirects here. For the Tracy Bonham song, see Navy Bean (song). "French bean" redirects here. For the Rowan Atkinson film, see French Bean. 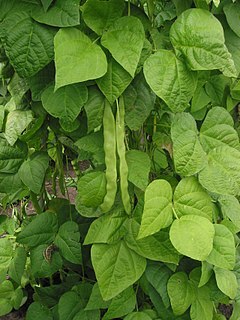 The common bean, Phaseolus vulgaris, is an herbaceous annual plant domesticated independently in ancient Mesoamerica and the Andes, and now grown worldwide for its edible bean, popular both dry and as a green bean. The leaf is occasionally used as a leaf vegetable, and the straw is used for fodder. Botanically, the common bean is classified as a dicotyledon. Beans, squash and maize constituted the "Three Sisters" that provided the foundation of Native American agriculture. Beans are a legume and thus acquire their nitrogen through an association with nitrogen-fixing bacteria. The hypocotyl emerges from the seed coats and pushes its way up through the soil. It is bent in a hairpin shape — the hypocotyl arch (Crozier's hook) — as it grows up. The two cotyledons protect the epicotyl structures — the plumule — from mechanical damage. Once the hypocotyl arch emerges from the soil, it straightens out. This response is triggered by light (phototropism). While this may be caused by most wavelengths of light, the critical photoperidic mechanism is sensitive to red or far red light. This mechanism is crucial, not only to Phaseolus beans, but to most flowering plants. It defines the phenology of their growth, and in some cases growth habits. The cotyledons spread apart, exposing the epicotyl, consisting of two primary leaves and the apical meristem. In many dicots, the cotyledons not only supply their food stores to the developing plant but also turn green and make more food by photosynthesis until they drop off. Before they are eaten, the raw bean seeds should be soaked in water for several hours and then boiled for at least ten minutes in new fresh water to degrade a toxic compound - the lectin phytohaemagglutinin - found in the bean which would otherwise cause severe gastric upset. This compound is present in many varieties (and in some other species of bean), but is especially concentrated in red kidney beans and white kidney beans (Cannellini beans). Although in the case of dry beans the ten minutes required to degrade the toxin is much shorter than the hours required to fully cook the beans themselves, outbreaks of poisoning have been associated with the use of slow cookers whose low cooking temperatures may be unable to degrade the toxin. Sprouts of pulses high in haemaglutins should not be eaten. Kidney beans, especially, should not be sprouted. Dry beans will keep indefinitely if stored in a cool, dry place, but as time passes, their nutritive value and flavor degrade and cooking times lengthen. Dried beans are almost always cooked by boiling, often after having been soaked for several hours. While the soaking is not strictly necessary, it shortens cooking time and results in more evenly textured beans. In addition, discarding one or more batches of soaking water leaches out hard-to-digest complex sugars that can cause flatulence, though those who eat beans regularly rarely have difficulties with flatulence as intestinal microbes adjust. There are several methods including overnight soaking, and the power soak method, which is to boil beans for three minutes, then set them aside for 2-4 hours, then drain and discard the water and proceed with cooking. Common beans take longer to cook than most pulses: cooking times vary from one to four hours but are substantially reduced with pressure cooking. In Mexico, Central America and South America, the traditional spice to use with beans is epazote, which is also said to aid digestion. In East Asia a type of seaweed, Kombu, is added to beans as they cook for the same purpose. Salt, sugar, and acidic foods like tomatoes may harden uncooked beans resulting in seasoned beans at the expense of slightly longer cooking times. Dry beans may also be bought pre-cooked and canned as refried beans, or whole with water, salt, and sometimes sugar. There are three commonly known types of green beans: string or runner beans, stringless or French beans (depending on whether the pod has a tough, fibrous "string" running along its length), and snap beans, with a thin flat pod that requires less cooking time. Compared to the dry beans, they provide less starch and protein, and more vitamin A and vitamin C. The green beans are often steamed, stir-fried, or baked in casseroles. Over 130 varieties of snap beans are known. Varieties specialized for use as green beans, selected for the succulence and flavor of their pods, are the ones usually grown in the home vegetable garden, and many varieties exist. Pod color can be green, golden, purple, red, or streaked. Shapes range from thin "fillet" types to wide "romano" types and more common types in between. French Haricots verts (green beans) are bred for flavorful pods. As with other beans, prominent among them lima beans, soybeans, peas, and fava beans, common beans can be used for fresh shell beans, can also be called shelling beans, which are fully mature beans harvested from the pod before they have begun to dry. Nutritionally, shell beans are similar to dry beans, but in the kitchen are treated as a vegetable, often steamed, fried, or made into soups. The nuña is an Andean subspecies, Phaseolus vulgaris subsp. nunas (formerly Phaseolus vulgaris (Nuñas Group)), with round multicolored seeds which resemble pigeon eggs. When cooked on high heat, the bean explodes, exposing the inner part, in the manner of popcorn and other puffed grains. The Anasazi bean (aka Aztec bean, Cave bean, New Mexico Appaloosa) is a bean native to the North American Southwest. The black turtle bean has a dense, meaty texture and flavor reminiscent of mushrooms, which makes it popular in vegetarian dishes such as the Mexican-American black bean burrito. It is a very popular bean in various regions of Brazil, and is used in the national dish, feijoada. It is also a principal ingredient of Platillo Moros y Cristianos in Cuba, is a must-have in the typical gallo pinto of Costa Rica and Nicaragua, and is served in almost all of Latin America as well as many Hispanic enclaves in the United States. The black turtle bean is also very popular for making into soups which are best eaten with Cuban crackers. Cranberry beans originated in Colombia as the cargamanto. The bean is a medium large tan bean, splashed with red/black to magenta streaks. Borlotti beans, also known as roman beans or romano beans (not to be confused with Italian flat beans, a green bean also called "romano bean"), are a variety of cranberry bean bred in Italy to have a thicker skin. It is very popular in Italian, Portuguese and Turkish cuisine. The pinto bean (Spanish: frijol pinto, literally "painted bean") is named for its mottled skin (compare pinto horse), hence it is a type of mottled bean. It is the most common bean in the United States  and northwestern Mexico , and is most often eaten whole in broth or mashed and refried. Either whole or mashed, it is a common filling for burritos. The young pods may also be used as green beans. In the southwest United States, the pinto bean is an important symbol of regional identity, especially among Mexican Americans. Along with the chile/chilli, it is one of the official state vegetables of New Mexico (under the name frijol). The prepared beans are commonly known as frijoles. This type of bean is also referred to as "Cowboy Beans" in Texas, all along the Mexican border and wherever Mexican cowboys were employed. In areas where Mexican cowboys did not travel on the trails north from Texas, it was probably not known. This is the bean most commonly used for refried beans (fresh or canned) and in many dishes at Tex-Mex restaurants. Rice and pinto beans served with cornbread or corn tortillas are often a staple meal where there is limited money for meat, as the combination of beans and corn creates all the protein amino acids needed in a meat substitute. When it comes to making chili, if a bean is added, this is the one typically used, although the kidney bean, black bean, and many others may also be used in other locales (see below). In the southeastern part of the United States, pinto beans were once a staple of the poor (usually eaten with cornbread, milk, and cabbage), especially during the winter months. Some churches in rural areas still sponsor "pinto bean suppers" for social gatherings and fund raisers. The alubia pinta alavesa, or the "Álava pinto bean", is a red variety of the pinto bean which originated in Añana, a town and municipality located in the province of Álava, in the Basque Country of northern Spain. In October, "la Feria de la alubia pinta alavesa" (the fair of the Alubia pinta alavesa) is celebrated in Pobes. The kidney bean with its dark red skin is named for its visual resemblance to a kidney. The kidney bean is also known as the red bean, although this usage can cause confusion with other red beans. Red kidney beans (rājmā in Hindi and Punjabi) are an integral part of the cuisine in northern region of India. Sometimes kidney beans are used in the red beans and rice of Louisiana Creole cuisine. Other times small red beans are used. Small red beans are noticeably smaller and darker than kidney beans. They have a smoother taste and are preferred for Cajun cuisine. Small kidney beans used in La Rioja, Spain, are called Caparrones. Other white beans are Cannellini (a quite popular variety in Central and Southern Italy) and Great Northern. Peruano beans (also called Canary beans) are small, oval, yellow colored beans about 1/2 inch (1 cm) long with a thin skin. Peruano Beans have a creamy texture when cooked, and are one of the top-selling beans in Mexico City since 2005 (being native to Mexico, despite the name). ^ "Kidney Beans". The world's healthiest foods. http://www.whfoods.com/genpage.php?pfriendly=1&tname=foodspice&dbid=87. Retrieved on 2007-11-05. ^ "Foodborne Pathogenic Microorganisms and Natural Toxins Handbook:Phytohaemagglutinin". United States Food and Drug Administration. http://www.cfsan.fda.gov/~mow/chap43.html. Retrieved on 2007-11-06. ^ Facciola, Stephen (1998). Cornucopia II : a source book of edible plants. Kampong Publications. ISBN 0962808725. ^ Choung MG, Choi BR, An YN, Chu YH, Cho YS. Anthocyanin profile of Korean cultivated kidney bean (Phaseolus vulgaris L.) J Agric Food Chem. 2003 Nov 19;51(24):7040-3. Retrieved 6 August 2006. ^ Sando, Steve; Barrington, Vanessa (2008). Heirloom Beans. Chronicle Books. p. 15. ISBN 978-0811860697. Lost Crops of the Incas, p 174 displays a popped seed of P. vulgaris nunas. (An extremely attractive color photograph by J. Kucharski featuring many cultivars can be found in Lost Crops of the Incas between p 192 & p 193, unfortunately not shown on web site). USAID fact sheet with nutritional information on pinto beans. This page was last modified on 23 March 2009, at 20:36. There are some good books out there on cooking beans. If you soak them too long, they can make you sick as hell.